Condo Blues: Would You Use a Toilet Lid Sink? Here’s an interesting way to save water in the bathroom. Replace your traditional bathroom sink with a toilet lid sink for washing your hands after doing, uh… you know bathroom activity. The toilet lid sink connects to the same water pipe that feeds a regular bathroom sink with clean water. After hand washing the faucet shuts off automatically and the dirty water drains from the sink into the toilet tank reservoir for later flushing. That’s where the water saving part comes in because you are using greywater to flush your toilet. 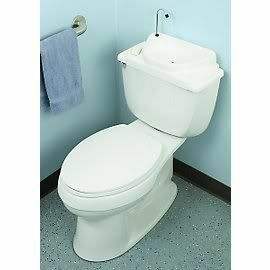 The toilet lid sink is about the same price as a basic no frills conventional bathroom sink. There are a few drawbacks. Some report that the toilet link sink may not fit on nonstandard toilet tanks. Others say that the water can be cold in winter because the sink only has one spigot and it is not temperature controlled. In addition to its water saving features, I can see how a toilet link sink can be a space saver for ½ baths or small powder rooms. However, the thing I wonder is what about the Ick Factor? It looks like you are washing your hands with water that is coming from the toilet tank instead of the used water going down the sink drain and into the toilet tank. Would this bother you? What about your guests? Do you care what other people think? I wonder if installing a toilet lid sink like using reusable cloth toilet paper (something I can’t get my head around and don’t plan to try anytime soon. However, as always, your mileage may vary) and once you’ve tried it and gotten over the Ick Factor you swear that it’s preferable and won’t go back? Would you consider installing a toilet tank sink in your home? Why or why not? it does look yucky, but I really like the idea of using gray water, especially here in CO where it's so dry! I would try it. I like the idea, and have thought about getting one of these, but I've been turned off by the idea of the frigid, frigid water coming out all winter. I guess it's a logical thing to do, but I don't know if I could bring myself to use it! Interesting. My kids would have a heyday with it, though. But, it could work. These have been around for at least 25 years in other countries. I guess I don't get what the "ick" factor is. Is it that the pure water comes through a spigot that is within 2 feet of a toilet, or is it that you are expelling your waste into slightly used water? There really is no ick factor. I think an overlooked feature of this product, that could have the biggest water conservation impact is its ability to help detect internal toilet tank leaks. A drippy sink will indicate that your toilet tank has a leak. Did you know that as much as 5% of all U.S. annual water usage can be attributed to toilet leaks!! !